Before you start developing your course, be sure to clarify what your client wants to accomplish with this course—in other words, the training goal. You’ll also need to assess where your learners are currently. Once you have your starting point and endpoint identified, your job is to design the best course to get them from one to the other. Think about what you want learners to be able to do with what they learn from your course. Avoid vague words like “know” or “understand”—those are not easily measurable. Instead, be specific in describing the tasks or actions you want them to perform with what they learn from your course. Identify the learners for your course. You don’t need to do an in-depth analysis—just narrow down who specifically your learners are: Managers? New employees? Salespeople? Then target your audience. What Prerequisite Skills or Knowledge Do They Need in Order to Start? When you define what knowledge or experience learners need for your course, you have a clear instructional starting point. Determining this also helps you avoid missed assumptions about what learners already know, or need to know. It’s ok if your course doesn’t provide the prerequisite content—though you can choose to add it—you just need to understand the baseline knowledge needed to start your course. Try to be as specific as possible when you answer these questions. You can drill down even further and create sub-objectives to your main objective. The information you uncover will help you identify the content and learning activities you’ll need for your course to reach its goal. Here’s an example: say you’re creating a course for mortgage company employees on how to properly process FHA loans. Your main objective might be to teach loan officers how to process FHA documentation to acquire proper loan qualification. Train loan officers to identify correct documents required for FHA loans. Train loan officers to identify credit requirements for FHA loans. Train loan officers to identify employment requirements for FHA loans. 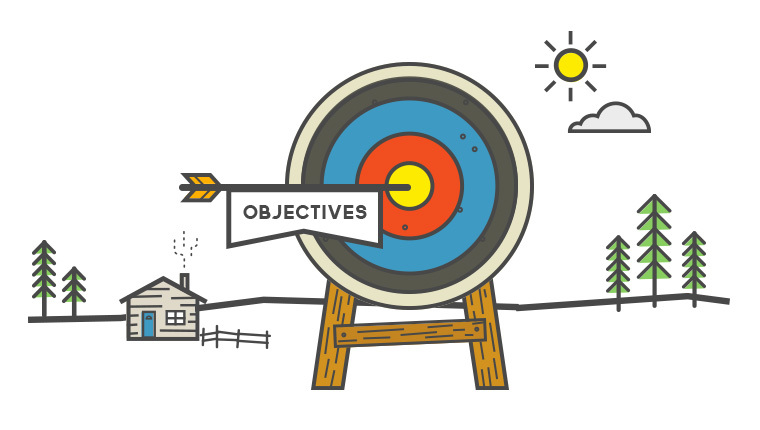 Rest assured, there’s no one way to write e-learning course objectives. Just focus on making the as straightforward and measurable as possible. Then, once you have your objectives, you can start to collect, create, and sort content and learning activities to support them. Your objectives are also an easy way to communicate to your client exactly what the course accomplishes. These learning milestones guide learners to the main goal your client wants to reach. With those in place, you and your client can be confident that learners will make measurable progress along the way. Thanks Nicole, you've made this look really simple. I'm working on a prerequisite "knowledge"-oriented tutorial right now for our Level 1 software class. The three-day class is where they will actually learn how to 'do' everything. The prerequiste tutorial is meant to give them some foundation knowledge on the architecture before they start class. I'm having trouble coming up with actionable objectives. It really is some stuff the trainer wants them to "know" and "understand" before they come learn how to apply it in the software. They want to save some class time. Do you have any tips on creating something effective and not just an info dump for something that is very info-oriented? Hi Heather - Have you tried a list of action verbs to help the development process? I find they help me clarify objectives to make them much more specific than I could without them. I like Bloom's Taxonomy Action Verbs. It is clean and simple - so clear and easy to follow. Unfortunately the Google link is anything but - so just do a search for "Bloom's Taxonomy Action Verbs" or "action verbs for learning objectives" and try some out. Hope this helps. Hi Heather! A lot of people encounter this situation when designing a new course. The goal is to begin the performance-based part of training with participants who share a common skill level in the basics. In setting measurable learning objectives around base knowledge such as the architecture, consider focusing on lower-level skills. For example: recite the parts of the architecture, recall the purpose of each part of the architecture, etc. For participants who can 'do' that already, consider learning objectives around mid-level skills, such as: chart the workflow for [xyz process using the architecture], list common failures that occur [in the xyz process they charted], explain underlying causes of common failures in [doing xyz with the architecture], describe how to recover from [xyz failure]. Once the base knowledge can be demonstrated, you're ready to move on to designing the performance-based part of your course, which is what most people think of as the 'doing.' Does that help? Good luck! Hi Heather. For me good objectives start with accurately selecting verbs to describe what students will do in the course so the objectives can be used to guide the content, activities, and assessments. When the instructor is not clear on what they want you see phrases like: "Students will be able to demonstrate..." when they do not actually demonstrate anything. I find a backwards design approach can help in these situations. How does the instructor plan to measure whether students have the prerequisite knowledge? If it is an automated quiz, for example, what actions will they take to answer the questions? What will students actually do during the quiz to show competence? A matching activity? Create a list? Order the steps of an analysis? Students will match the physical structures of the Java coding architecture to their functions to a standard of 90% correct before beginning this course. Students will list the ten most important parts of the Java coding architecture before beginning this course. Students will plan their analysis of a coding project by naming the nine steps of code analysis (I'm making this up)and ordering them along a timeline. I think for a prerequisite course, having all four pieces of the formal objective is helpful. The audience, the action, the conditions of performance and the standard. In many if not most cases, we tend to narrow the objectives to the audience and the verb when, particularly in e-learning, we need all four to give students a clear idea of what is expected. For those who want more on verbs in objectives, here's a helpful link to Bloom's Taxonomy: http://www.celt.iastate.edu/teaching/effective-teaching-practices/revised-blooms-taxonomy/revised-blooms-taxonomy-flash-version Enjoy!